Chester have signed young Burnley striker Jason Gilchrist on a month-long emergency loan. The mid-table National League club have also secured 22-year-old defender Ryan Astles from Cheshire non-league neighbours Northwich Victoria. 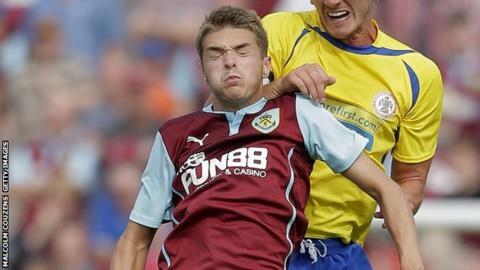 Gilchrist, 21, is looking to regain match fitness after suffering a broken ankle in the Clarets' pre-season friendly with St Mirren. He will be reunited with Burnley team-mate Steven Hewitt at Bumpers Lane. Midfielder Hewitt signed for City on 2 January on a deal until the end of the season, following his release by the Clarets. Burnley also loaned another player to Chester, defender Alex Whitmore, in November. But, although City boss Steve Burr would like to have kept him on, he is expected to go back out on loan to another club. Jason Gilchrist is yet to make his Burnley debut but he did net a hat-trick against Manchester United at Old Trafford in the FA Youth Cup in 2012. He has had two previous experiences on loan away from Turf Moor, having been at Droylsden in 2013 before finishing last season with Accrington Stanley, where he made his Football League debut. Ryan Astles, who was on the books of both Chester and local rivals Tranmere Rovers as a boy, has since played for Wigan Athletic reserves, Buckley and Rhyl before joining Northwich. He was part in Northwich's run to the second round of the FA Cup, scoring in their first round replay win at Boreham Wood - and also playing the full 90 minutes in the 3-2 defeat at Northampton.